The “Emirates Freeplay Pool Table” is a classic British slate bed pool table which represents the ultimate in luxury and accuracy. The Emirates slate bed pool table is constructed with only the finest raw materials and manufactured using the latest machining technology. The Emirates Freeplay slate bed pool table has polished chrome corners fitted with quick drop pockets and life long pocket liners inserts. The Emirates is unique for a Freeplay pool table in that it is also fitted with a cue ball separator which you would normally only find on a coin operated pool table so the cue ball return to the “D” end when potted. 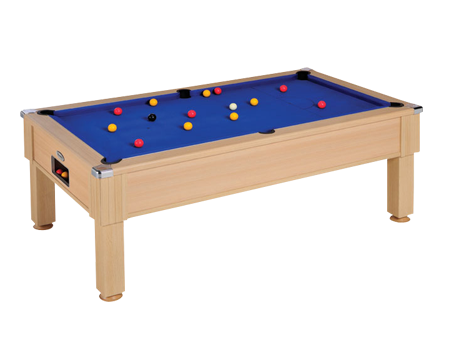 The “Emirates Freeplay Pool Table” is suitable for domestic and commercial locations because of its excellent build quality.